So now you know what the Cloud is and how safe it is, apart from storing your files in cloud storage, just what can you do with it? One of the best features of using the cloud is that you are no longer taking up your computer’s memory for storage. Not just your files, but also software. Instead of buying software for particular tasks, you can use the software you need, only when you need it, in the cloud. It may not be feasible to replace some software you use all the time, but it could be really useful if you’re using someone else’s computer that doesn’t have the same software as yours; or if you rarely use a particular type of software, and can’t justify buying it. As long as you can connect to the internet you can get the job done. With a Windows Live login you can use Microsoft’s online versions of Word, Excel, PowerPoint and OneNote for free. This works with SkyDrive, which stores your documents and files online and allows you to share your files with other users if you are collaborating on a document. Just go to http://office.microsoft.com and click one of the links below ‘Select a web app to create your document’. The products are cut-down versions of the full desktop applications, so you won’t have all features, but you’ll still be able to edit and create documents, spreadsheets and presentations. Great for creating Microsoft Office-compatible documents, spreadsheets and presentations. The Google Drive viewer can also open special types of files (Adobe Illustrator and Photoshop files, Autodesk AutoCad files, archive files, some markup/programming code, and more), so it can also be great for storing files that you want to share with others who don't have the programs installed to open them. Google Drive has a 10GB maximum file size which means you can upload and share video files and other huge project files. Through the Chrome web store you can also add third-party apps for Drive; tools for faxing, AutoCad, diagrams, project management, document signing and more. Take a look here for what’s available. This online presentation software is available free for non-commercial use. You can create and edit presentations, and work collaboratively with up to four other users. You get 250MB of storage, collaboration and publishing tools, Google Docs integration and the ability to import presentations and print them to PDF. This is also one of the add-ons for Google Drive. With Zoho you can upload existing Microsoft Office documents for editing online, and create new documents, spreadsheets and presentations. You get 1GB of free storage and you can collaborate with other users on the same document. 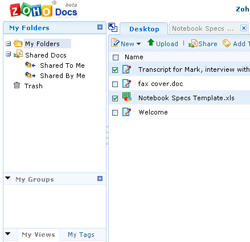 Zoho offers a range of other products too; tools for creating databases, note-taking, CRM (Customer Relationship Management), project management (Project2), human resources tools (Zoho People), calendars, planners, invoicing and more. Take a look at Zoho here. Google Cloud Print makes it possible to send any document or image to a printer from any location. For example, if you wanted to print out a letter at home while at work, you could use the service to send that letter to your home printer and have it waiting for you when you get back. The service can also print web pages and other documents to PDF format and save them in your Google Docs account. If just takes Google Chrome and a few button-presses to set it up; and just about any printer can be used, the setup process just varies depending on the type of printer. You can also print from your smartphone. There’s a Google Cloud Print Android app, as well as cloud printing support in the Google Docs Android app. If you’re using an iPhone, iPod touch or iPad you can use PrintCentral Pro to print with Google Cloud Print as well. For printing from a Mac, if you don’t want to use Google Chrome, you’ll need the Cloud Printer app which you can download for free from the Mac App Store. Unfortunately it can only handle documents that Google Docs can view. Also, it doesn't function like an actual printer and instead requires you to choose a file you want to print from the dedicated app. Google is always adding more Cloud Print apps and add-ons – take a look here for the latest on offer. · The speed at which you can work in the cloud are dictated by the speed of your internet connection. · Except with some applications, you won’t have access to your files if you are not connected to the internet, ie. if the internet is down, so are your files.